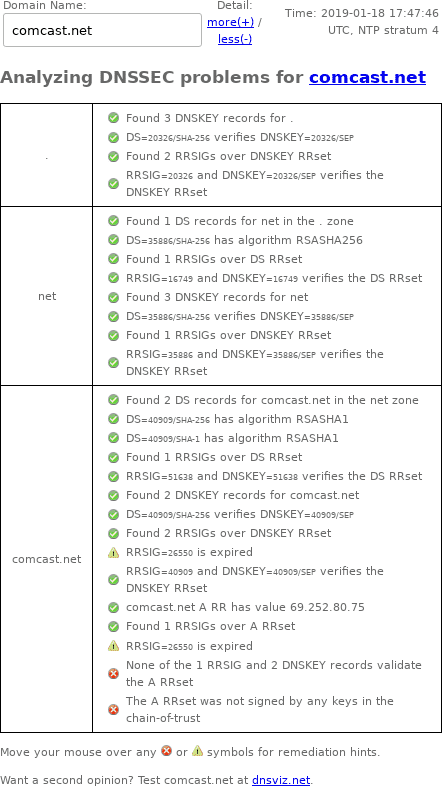 This page gives some details on the comcast.net DNSSEC outage on January 18, 2019. Comcast is one of DNSSEC's biggest supporters and has had several DNSSEC outages. zonemaster.labs.nic.cz archived "RRSIG with keytag 26550 and covering type(s) DNSKEY has already expired (expiration is: 1547833307)." zonemaster.net archived "RRSIG with keytag 26550 and covering type(s) DNSKEY has already expired (expiration is: 1547833307)." zonemaster.fr archived "RRSIG with keytag 26550 and covering type(s) DNSKEY has already expired (expiration is: 1547833307)."